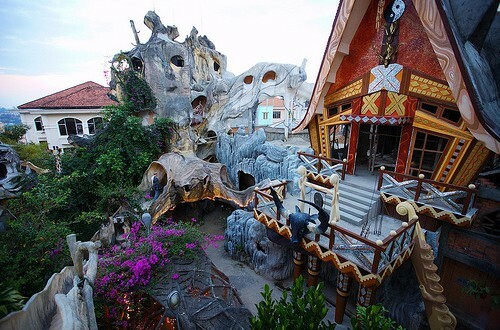 Hằng Nga guesthouse (Vietnamese: Biệt thự Hằng Nga), popularly known as the “Crazy House” (Vietnamese: Ngôi nhà quái dị), is an unconventional building designed and constructed by Vietnamese architect Đặng Việt Nga in Đà Lạt, Vietnam. 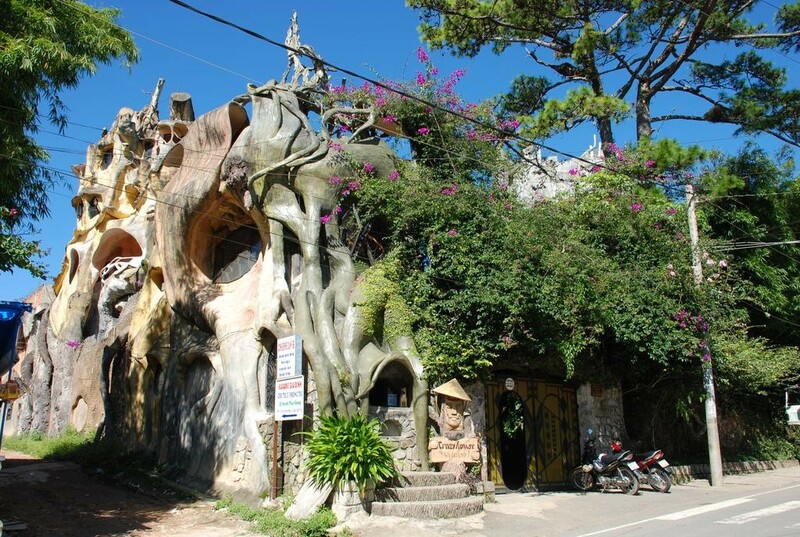 Described as a “fairy tale house” (Hằng Nga, Vietnamese, is the Chinese goddess of the Moon), the building’s overall design resembles a giant tree, incorporating sculptured design elements representing natural forms such as animals, mushrooms, spider webs and caves. Its architecture, comprising complex, organic, non-rectilinear shapes, has been described as expressionist. Nga has acknowledged the inspiration of Catalan architect Antoni Gaudí in the building’s design, and visitors have variously drawn parallels between it and the works of artists such as Salvador Dalí and Walt Disney. Since its opening in 1990, the building has gained recognition for its unique architecture, being highlighted in numerous guidebooks and listed as one of the world’s ten most “bizarre” buildings in the Chinese People's Daily.